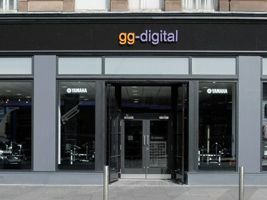 PRESS RELEASE: Glasgow music store, GG Digital, Scotland's largest hi-tech store, are hosting a special Meet the Experts day at their Trongate location on Saturday 1st May to celebrate a major showroom refit in association with Yamaha and Roland . This special instore event marks the opening of the Scotland's largest Roland Planet and the UK's 1st Yamaha display area at GG Digital - 2 dedicated spaces in the new store where you can experience the full lineup of products from both suppliers. From the latest POCKETRAK portable recorders through to the new Roland drum kits, the new areas have all the hardware you need to compose, create and perform with the day really focusing on interacting with the gear! Senior Roland and Yamaha product specialists will be on hand throughout the day to guide you through the range and offer technical advice. Freebies and support software will be available throughout the day! Starting from 11am with all-day performances and interaction.